According to legend, Fin de Copenhague was composed and printed in the space of just 24 hours. Or maybe it was 48 hours. Either way it was pulled off with a dizzying burst of speed and with nonchalantly scathing brilliance by the Danish artist Asger Jorn, credited as main author, and the French theorist and writer Guy Debord, who is named as “technical adviser for détournement” — back to that in a moment. Fin de Copenhague (Goodbye to Copenhagen) will be familiar, at least by reputation, to scholars and admirers of the Situationists, and perhaps to aficionados of the artist’s book, though not many will have perused an original copy since only 200 were printed by Permild & Rosengreen in Copenhagen, and published by Jorn’s “Bauhaus Imaginiste” in May 1957. I have never seen one myself. Christie’s sold a copy in 2011 for $14,427. What I do have, and show here, is a reprint published in 1986 by Editions Allia in Paris (it was reprinted again in 2001). It is one of those books that I count myself lucky to have stumbled upon by chance without knowing, at the moment I picked it up, anything about it. In fact, I couldn’t say now why I did pick it up, many years ago, because it has the plainest, most misleading cover. 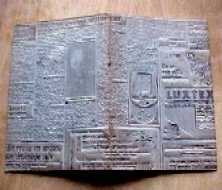 The original, unreproducible covers, made of super-tactile flong embossed with pages from newspapers, were all different. The book’s pages ripple with coarse trails of pigment and explode with wild energy. As the story goes, not long after they had arrived in Copenhagen Jorn and Debord stole a pile of newspapers and magazines from a newsstand, which they cut up to make 32 collages. At the printer next day, Jorn dribbled ink on to the zinc plates from the top of a ladder; these were then etched. The abstract shapes, like the frenetic daubings of a monkey wielding a paint brush, were printed on both sides of the sheet in gradated color, and the collage elements were printed in black on top of them. When the sheet was trimmed and bound, the formerly continuous marks and colors of Jorn’s carrying structure produced random collisions of colour and shape on the spreads. Pure chance completed the design. In 2008, a student at the Delft University of Technology named Bart Lans reconstructed the two sides of the sheet to show how the components would have looked before assembly. Ironic attacks on consumerism are highly familiar now, to the point of triteness, but 55 years ago, with economic “abundance” still an enticing promise, the Situationists’ critique of materialism was new. Fin de Copenhague is a premonition of the most disenchanted and deconstructed pages of Adbusters half a century later. “Le problème est résolu” declares one of the clippings. Jorn and Debord’s answer to this unduly confident claim is a page of nothing but splatters. Nor did Debord and Jorn rest on their laurels. A second collaboration by the two Situationists, on the book Mémoires, published in 1959, is just as indifferent to the “sacred rituals of printing” — as the AR put it — in its total reinvention of the page in the cause of political theory. another fantastic piece on another visceral, passionate classic. thanks Rick. p.s. if you've never come across Ake Hodell then i think you'd enjoy a poke around . . .
as usual, great post and topic. All about situasionism interest me since I read "Lipsticks Traces", essential in those years. About this images, the reconstruction by Bart Lans is a true finding. It explains me a lot. Great!